Addressing a crowd of cheering supporters on the Texas Capitol's south steps, Lt. Gov. Dan Patrick declared Tuesday that he wanted both the House and Senate to take a vote on an upcoming private school choice bill. "We want a vote up or down in the Senate and in the House this session on school choice. It's easy to kill a bill when no one gets to vote on it," Patrick said at the "National School Choice Week" rally, which drew thousands of students and family members from charter schools and private schools. Gov. Greg Abbott also spoke at the rally, saying he wants a chance to sign school choice legislation into law this year. "Who else needs a choice? 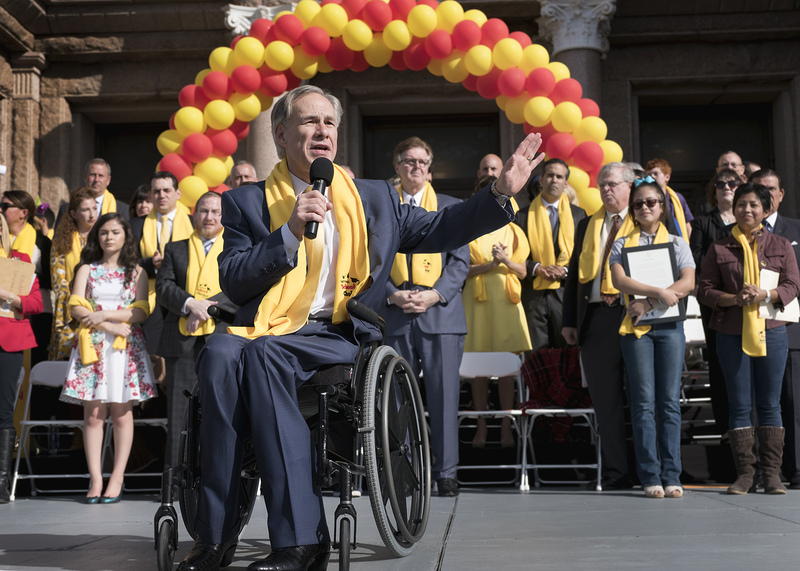 The governor of Texas needs a choice," he said to the crowd wearing bright yellow scarves, a signature accessory of the school choice event. Patrick is expected to announce the filing of a bill advocating for education savings accounts, which would allow parents to use taxpayer money for private and parochial school tuition, as well as other education costs. The education savings accounts are expanded versions of school vouchers, which use public money to pay for tuition costs. In the 2015 session, the Senate voted through Patrick's private school choice bill. But the legislation did not get a vote in the House. "I know Lt. Gov. Patrick and legislative leaders from both the House and the Senate have been working on a school choice law," Abbott said. "I hope and I urge that that law reach my desk. And when it does, I will make the choice to sign it and authorize school choice in the state of Texas." School choice advocates are also backing another option this session. Houston Republicans Sen. Paul Bettencourt and Rep. Dwayne Bohac filed bills creating a $100 million tax credit scholarship pilot program, allowing corporations to contribute to nonprofits that award students with scholarships to private schools. In return, corporations get an insurance premium tax credit from their state tax bill. Critics argue that education savings accounts would have the same effect as vouchers and would siphon much-needed funds from the state public education system. "State leaders seem committed to force our neighborhood public schools to do more with less for the sake of private school vouchers," said Kathy Miller, president of state education board watchdog Texas Freedom Network. "Vouchers, by any name, are a scheme that strips critical funds from public schools and gives a discount to individuals who can already afford private school, and all at taxpayer expense and with zero accountability." A Senate school choice bill has not been filed yet, leading to confusion about which families would actually be eligible for education savings accounts. Some members of the crowd showed up to rally for or against their idea of what the bill would contain. Shawna Williams and Anne Wylie are parents of students at River City Christian School, a non-denominational San Antonio school that serves students with disabilities. They want to use education savings accounts to fund their children's school tuition — but that may not be as likely to happen as they're hoping. "I'm here because I want to spend our taxpayer money on tuition," said Williams, the mother of a fifth-grader at River City. Wylie said her daughter's public school ignored her learning disability and pushed her through the school system. "I have to pay a lot of money" in taxes, she said. "I want to be able to use a voucher or a tax credit scholarship" for tuition. But Williams and Wylie are likely not to be eligible for education savings accounts and other voucher-like options. Last year's private school choice bill only allowed parents to transfer their children from public schools to private or parochial schools. Private school choice advocates say Patrick's bill this session is likely to say the same. A contingent of homeschooling parents dressed in red formed a counter-rally near the front of the steps Tuesday, scared that a private school choice bill would put restrictions on parents who educate their kids at home. Karla Jahangit headed to the Capitol on Tuesday morning from Hutto, north of Round Rock, to hold a sign that read, "ESAs hurt homeschool choice." She home-schools four kids between the ages of 3 and 15. She worries that a bill for education savings accounts, in giving public money to parents who want to home-school, will also institute guidelines for curricula and testing for those parents. "We already have school choice, and we don't want to lose our choices," she said. Tuesday's rally marks the start of a protracted battle this session over whether Texas should allow parents to pay for private school with taxpayer money. Land Commissioner George P. Bush was among the speakers at a school choice rally at the Texas Capitol two years ago. Correction: An earlier version of this story said that Lt. Gov. 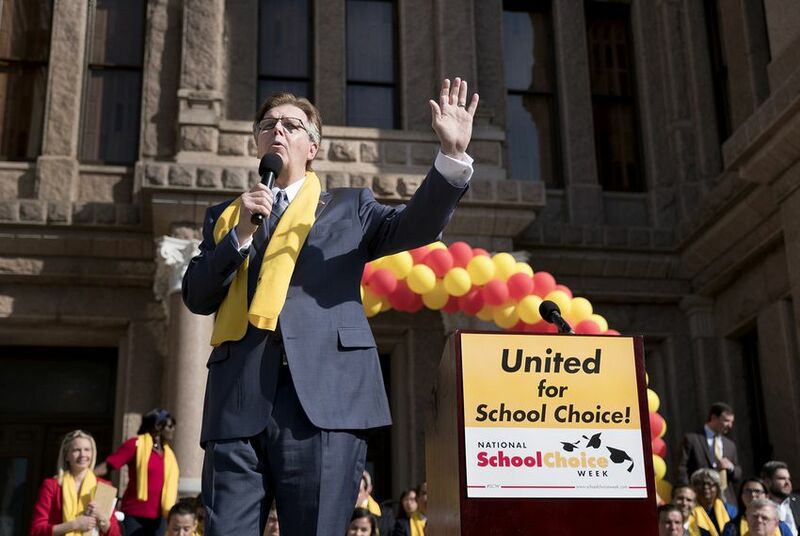 Dan Patrick was expected to file school choice legislation, but the lieutenant governor cannot file legislation himself.